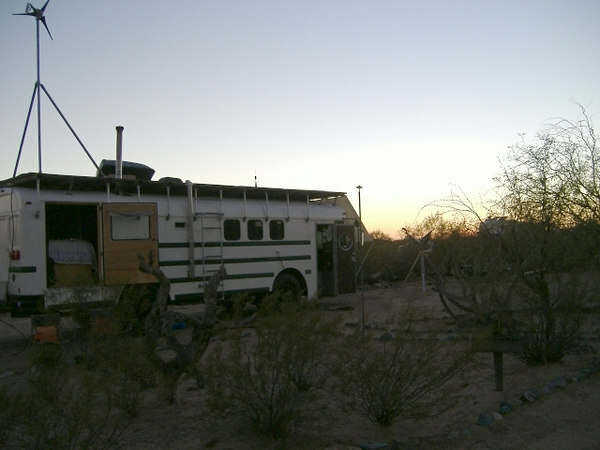 Wayfaring -- Living in the bus! 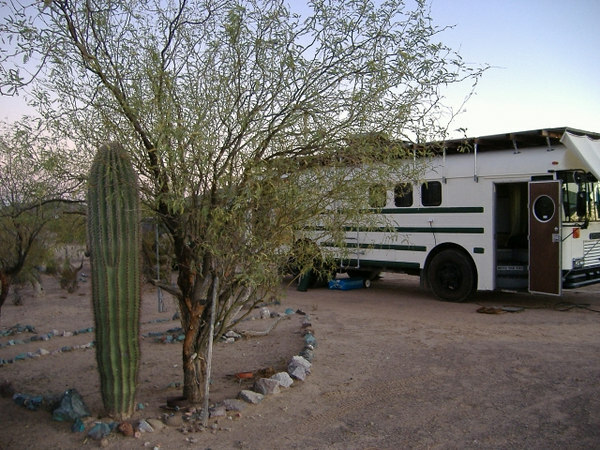 Over the weekend we moved from Catalina State Park to Coyote Howls Campground in Why, Arizona. It's 120 miles west of Tucson via the Tohono O'odham reservation, and 30 miles from the Mexico border towns of Lukeville/Sonoyta. Organ Pipe Cactus National Monument is a stone's throw away, as is the Cabeza Prieta National Wildlife Refuge. The main reasons we chose this area are the mild winters and the close proximity to Mexico. This is our spacious and private campsite. Our nearest neighbors are over one hundred yards away. 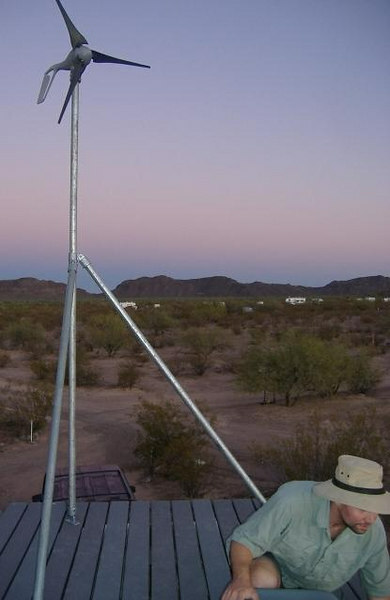 This evening (11/21) we assembled and erected the wind turbine! The turbine is a Southwest Windpower Air-X capable of producing 400 watts of peak power. We used 1.5" Schedule 40 galvanized iron pipe for the main mast and braces, and Kee Klamps as connecting pieces. Deck-level view of the eastern sky at sunset behind the turbine apparatus. Far-off neighbors in the distance. Still on the to-do list: Connect the wires to the battery bank, including a circuit breaker and stop switch. We also need to figure out a way to ground the entire system. 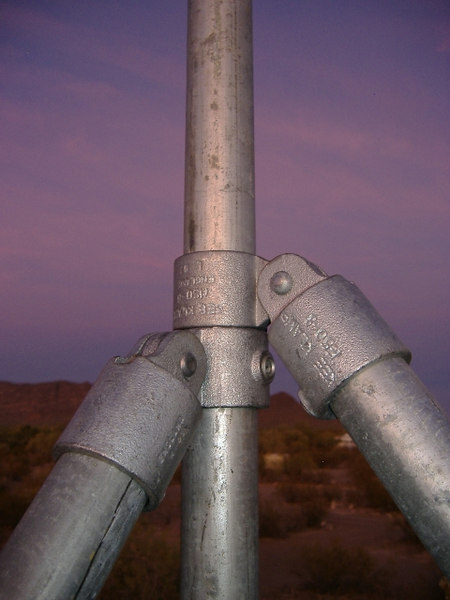 Kee Klamp fittings attach the support poles (1.5" SCH40) to the mast. 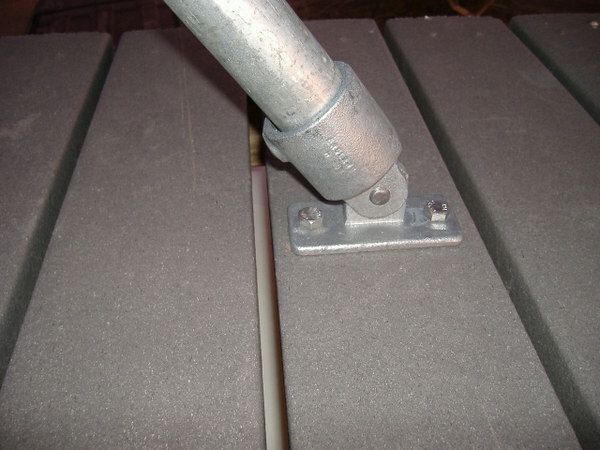 Kee Klamp flanges and 3/8" stainless hardware secure the support poles and mast to the deck.